I can’t even begin to tell you how differently I perceive this quote at this instant. Of course, the literal: When Mickey Mouse came to be in 1928, the Disney Company as we know and love was brought into being! What if Walt Disney meant something else by this comment as well? Perhaps I am in a contemplative mood. Perhaps it is the quiet after Expo storm that has me swept up. Whatever it is, it has me all goo-ied up in a big piece of humble pie. You see, not unlike dear Uncle Walt once sensed himself, I feel as if life so far has been a series of kicks in the teeth. Don’t get me wrong, I’ve had a heck of a lot of blessings; it’s just that, things I knew way down deep in my heart that I was meant to accomplish seemed… so… out… of…. reeeeeeeach. I completely comprehend that a person appreciates things more when they have to work on them, really I do, but so often I’ve thought a little nibble would be nice! I imagine that many of you have been in a similar character-building place. I have a sneaking suspicion we’re in good company here. I just spent this past weekend in Anaheim at the 2011 D23 Expo. I was amazingly fortunate to have been there- a feeling that was never lost on me at any point in the adventure. However, another feeling I began to experience, and one I claim a bit of familiarity with, is one of smallness. I’m not talking about the size of the Expo or even how many people were there, or how diminutive I am in stature (no short jokes, people). I mean there are so many aspects of Disney that I haven’t even begun to sink my teeth into, and all the people with booths who are clearly more established and in-the-know than I. This was a feeling that took me a bit by surprise. I grew up thinking “It’s a small world” and suddenly the world of Disney felt very large…after all. I felt quite mouse-like. Typically in these situations I get quiet and become even mousier. This time, there was a difference. There was a buzz of energy encompassing the entire convention center. Some people were dressed in their Disney best. Costumes of every character were present and these people instantly became part of the experience. Many donned Disney apparel of a more street worthy kind, and some added ears and pin lanyards. No one was apologetic about their Disney fanaticism…and I liked it! I had the privilege and honor of meeting some wonderful Disney folks I had only known via the Internet in the past. It struck me, in this cavernous place filled to the hilt with all sorts of Disney loving people trying to sell their websites and travel agencies and Disney memorabilia, that there is no die-hard competition here. In my own experience as a Disney travel writer I have come to know many others who do similar writing. It is a unity of people helping people, supporting one another, taking strengths from each other’s sites and trumpeting them so that the magic can be shared further. When something is that good, it is infectious and worth passing on. 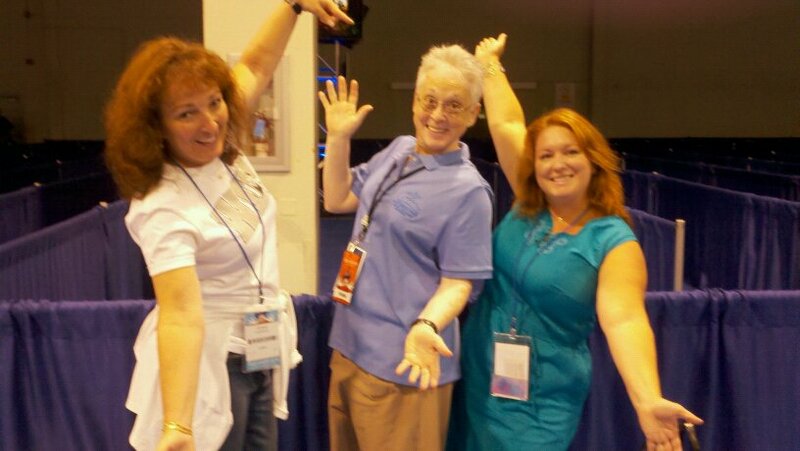 On the final day of the Expo, I was wandering the floor with my friend and fellow Disney blogger, Donna. She had stated earlier her disappointment that she had not yet gotten close enough to Deb Wills to meet her. For those of you who may not know (I can’t imagine, but I won’t judge), Deb is the creator of Allears.net. She began, 15 years ago, writing about her love of Disney. 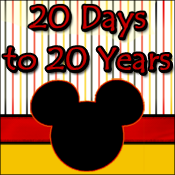 It has now grown exponentially and is an invaluable resource for anyone planning a Disney vacation. I know I personally send over all those who I help in their planning. With only a couple hours left in the day, Deb walks by. Donna jumps out of her skin at the chance to speak with her and an outpouring of emotion comes from within! I will just say right now that I am SO glad I was with Donna, not only for the fun she provided all day, but also for her boldness. I never would have been a part of such a conversation with Deb had I not been with Donna. I hope I can learn a lesson from her and become more daring. The heart of the matter lies here in this story of one completed circle and the beginning of a new one: Deb was on her way to meet her mentor. The creator of MiceChat is the one who inspired her 15 years ago. Merely steps away from Deb’s moment she had been waiting 15 years for, Donna and I stopped her and, I’d like to think, gave her a glimpse back to where she was when she began- passionate Disney writers speaking to a huge inspiration…almost in a Circle of Life fashion. Are you catching the emanating symbolism here? It was a moment I will treasure forever, and in 15 years I hope to see Deb again and be able to tell her just how far I’ve come and just how much pixie dust I’ve been able to share. I’m only guessing, but I bet Donna feels the same! We all start out small. However, each of us is a piece of the magic. Deb, with all her influence, is as humble as a person can be. When it comes right down to it, it is the passion, not the ego that drives. 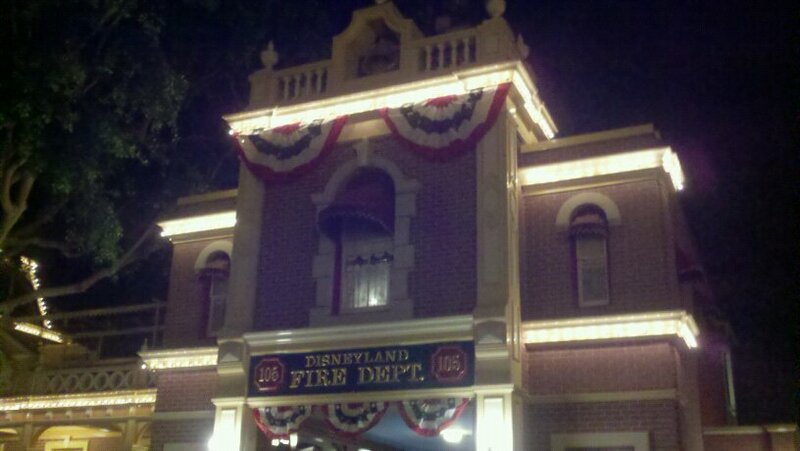 I am reminded of the light in the Firehouse window of Walt’s Disneyland apartment. It is a small symbol of the heart of this matter: The spirit; the memories of old and the ones yet to be made; the pixie dust and the joy; the dreams and boyhood remembrances of a man who believed in the magic. You can almost see the trail of this light as it slowly sparkles down Main Street with gratification. We can be the candle in the window, and bring that to the world. We may feel small as mice sometimes, but that’s exactly where it all started. LOVE THIS ARTICLE! it sums it all up for me in the most eloquent way!! Thank you!